How to strengthen the voice and knowledge of locals in planning processes? Many have argued that in order to face complexity and uncertainty, decision-making processes need to engage with a diverse set of actors representing different knowledges (see for instance recent article by Carpenter, Folke, Scheffer and Westley 2009, or from planning theory, Jonathan Murdoch, Post-structuralist Geography, 2006). One civil-society response seems to be to engage with an activity historically mostly attached to top-down and centralized control, and start producing your own maps! 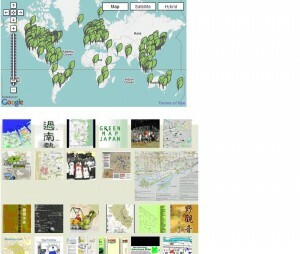 By merging community activism with cheap Internet mapping techniques, such local responses are growing into an emergent international movement of community map-makers at Green Map ®. Starting in New York in 1992 the organization now claims to collect hundreds of evolving maps across the world. Just recently the initiative reached one of the community organizations here in my own neigbourhood Bagarmossen, Stockholm, to build the “Stockholm Green Map” (betaversion). Of course maps have historically been seen as a tool for control, representing the vision of the ruler or the state. And although a critical analysis is still valid when it comes to community-maps, the Green Map ® project and similar projects certainly bring out new possibilities for the general public to participate in the production of facts, values, plans and visions about the landscape. Still though, community maps at Green Map seems to be a bias towards the values of sites and points, a bias that might miss social and ecological linkages across the landscape, which is of concern for the generation of ecosystem services and ecological resilience. 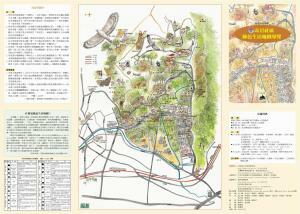 Another problem seems to be the openess of the map-making process. 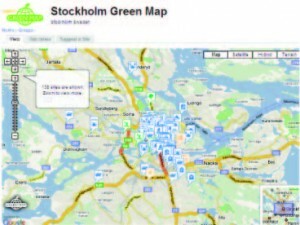 When zooming into the Stockholm Green Map one will also find gasoline stations (selling biofuels), restaurants (serving eco-food) and clothing stores. The map becomes a mosaic of quite non-related things vaguely placed under the umbrella of an urban sustainable lifestyle. A coherent narrative is missing that can bring out ne w perspectives and knowledges of urban realities so as to change spatial planning processes. Framed as a tool for organized public interests like urban (social) and environmental movements, however, this type of mapping could be valuable in visualizing surpressed values and forsaken spatial realities. As such it could enrich knowledge(s) needed for building more equitable and resilient cities.